Frank Yon, CEO of NMB Media, sat down with us to discuss his international alternative media company. Tell us a little bit about NMB Media. We started in 2001 and were formally known as National Mobile Billboards because we originally only offered mobile billboards. But as time progressed we added a multiplatform integration of brand ambassadors components that add to the impact of the mobile billboards. From then on we were NMB media. Today we are nationally based covering the majority of North America. Why did you choose out-of-home over 16 years ago? Out-of-home is good media opportunity for NMB Media. We wanted to be more micro-targeted and not in a situation where a client is buying zones or zip codes or DMAs like you do for TV or radio. Clients are locked into that specific demographic of that TV or radio station. With NMB Media, campaigns are cross-dimensional and cross-demographic. We’re reaching a wide array of races, ethnicities and age groups. It provides our clients with a unique opportunity of greater reach than the average TV commercial. What does NMB Media offer today? We offer a myriad of out-of-home advertising opportunities encompassing a wide variety of options. For instance, we offer adbikes within projection media, custom built prop trucks and digital bicycles featuring twin 42-inch monitors on either side. We also offer our standard brand ambassadors programs geared towards products or brand openings or brand awareness. What makes us unique is our GPS tracking. Other companies offer GPS tracking. What makes your tracking devices different from other? All of our media is in one way or another GPS tracked. Specifically our mobile billboards offers live GPS tracking. There’s no other company in the country that does up-to-the-minute live GPS tracking. Our clients can go online and see exactly where the message is being displayed at any point in time. The overall idea of our media is to enhance the social media aspects of campaign promotions. To tie into proof of performance, we combine GPS tracking with photo documentation and brand ambassador testimonials. It allows consumers to react to the event promotion and provides our clients with priceless feedback. Why is NMB Media so successful? Our delivery guarantee is the secret to our success. Some companies don’t ensure the client gets what they are paying for. Our guaranteed delivery goes the extra mile. The client’s media booking is going to be on time, the overall execution will be on time and they will receive the complete proof of performance showcasing the campaign results and the creativity that was executed in the field. With us, there’s generally an overrun of time and space with our media. A mobile billboard will be set up a day before the campaign and we don’t strip the media as soon as the campaign is over. With our overall professionalism, our guarantee of performance and the overrun opportunities, we have been pretty solid in the industry. How do you see the OOH industry overall and your company moving in the future? Programmatic buying is obviously the future of OOH. It allows the media planners or buyers across platforms in a general area to create a plan that fits their client’s needs. In this coming year we are introducing a new digital platform for mobile billboards that is unlike any other. This will allows us to be part of the programmatic buying experience and still be a part of the mobile experience in terms of being able to relocate that message throughout a targeted location. Additionally, I think the OOH industry in general is going to continue to grow because of individuals being away from their home more. You’re going to see OOH growth and it’s going to be more digital-oriented. One criticism of OOH is delivery. It might take a week for a billboard to be printed and posted. 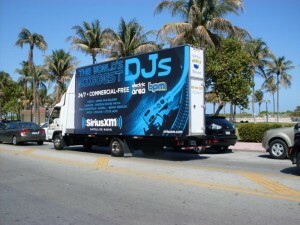 We are the only company that can offer overnight static mobile billboards nationwide. So unless you are NMB Media, it’s a challenge to get quick turnaround. Because of the need of rapid delivery to consumers, the whole digital experience is going to grow on all platforms. You’re going to see more media go digital because of this time criticism. Check out NMB’s profile to learn more.